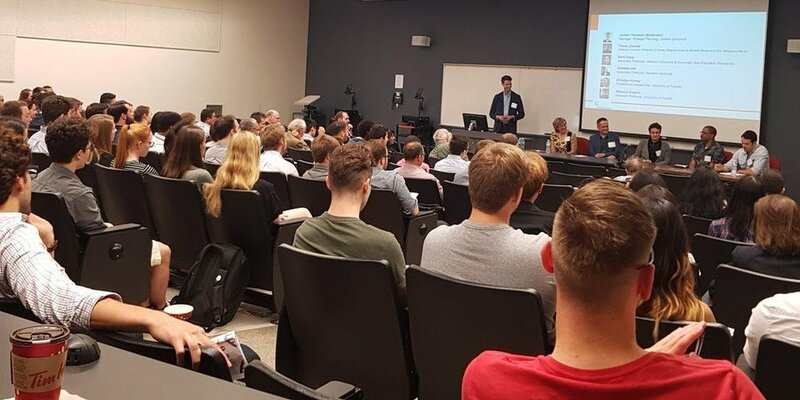 The panel discussion was well attended, highlighting the significant interest in synbio at Western University. Image courtesy of Western University Science. 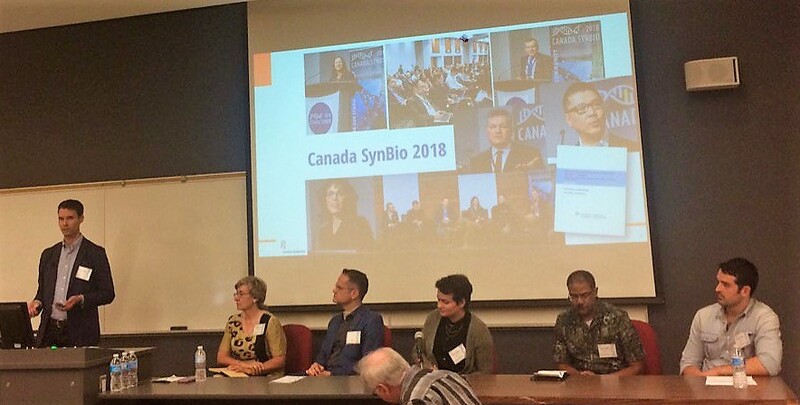 As a follow-up to the first Canada Synthetic Biology conference in March 2018, Ontario Genomics hosted a panel discussion at the Western Synthetic Biology Symposium 3.0 to discuss where the field is headed in Canada. Dr. Jordan Thomson, Manager of Strategic Planning at Ontario Genomics, moderated the event. Dr. Thomson also gave an overview of the significant contributions that Ontario Genomics has made to synthetic biology, pointing to their recent white paper (pdf) that outlines strategies for fostering the field in Canada. Questions and replies have been edited for brevity. What in synthetic biology are you excited about, and what does the synthetic biology community need? Dr. Rebecca Shapiro was excited and impressed by the recent growth of hubs and training programs specifically focused on synbio (i.e. at Concordia and Western). She felt that researchers should better engage with the public, to explain the field and address public concerns. Dr. Brendan Hussey was excited about recent new hires at Canadian universities of researchers with a synthetic biology focus. However, he stated the need for a champion in Canada, to lead a unified vision for promoting the field (which came up during the Canada Synthetic Biology 2018 conference as well). He also questioned the significance of grassroots synbio initiatives, believing instead that government and university recognition of synbio is essential, especially to attract researchers from the US and overseas. What can we in Ontario/Canada be doing better to foster synthetic biology? Dr. Jordan Thomson (Ontario Genomics) moderated the panel on the “Current and Future State of Synthetic Biology in Canada”. From left to right: Dr. Kathleen Hill, Dr. Mark Daley, Dr. Rebecca Shapiro, Dr. Trevor Charles, Dr. Brendan Hussey. Image courtesy of Western SynBio Symposium. Dr. Mark Daley expressed his frustrations as an interdisciplinary researcher, posing the rhetorical question, “what NSERC subject code do I pick?” when it comes to submitting grants. He noted that the NSF in the US is working to change how they review grants, to make it more accommodating to interdisciplinary research proposals. Dr. Trevor Charles stated that the lack of government support is hampering the growth of Canadian synbio start-ups. He stated that a program like the US SBIR grants should be implemented, which fosters small business research and development. The Government of Canada appears to have recognized this need, having recently launched similarly styled “Innovative Solutions Canada” grants. However, as of August 2018, public challenges utilizing synthetic biology have not been issued. Dr. Rebecca Shapiro stated that since it’s difficult to compete with the US, which has a larger per capita research budget, Canada should focus its synbio efforts on specific niches. However, deciding on these niches poses its own problems, which Dr. Hussey believed could be helped by having a synbio “champion” to focus Canadian efforts. Dr. Kathleen Hill also stated her desire to hear from the larger research community, to determine what these niches are. To best communicate the importance of synthetic biology, one conference participant stated the need to focus on commercialization, and not just having an academic approach to research.